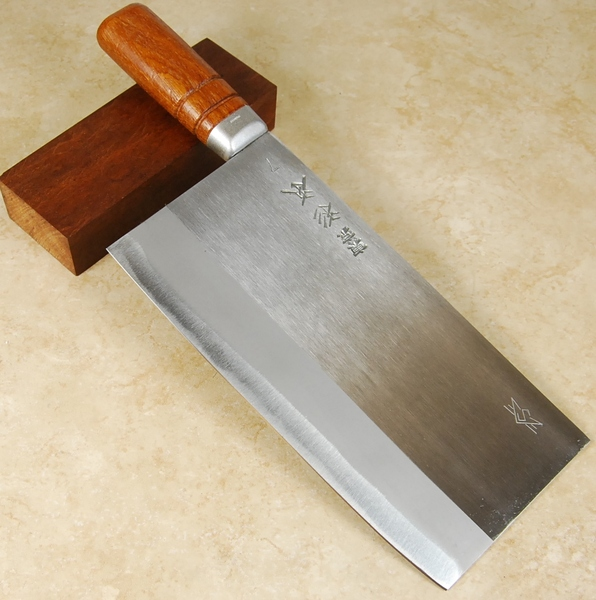 This multi purpose Chinese cleaver has a medium thick blade, weighs 580grams and measures 220mm by 110mm. 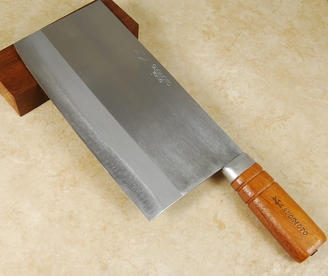 Sugimoto owns the Chinese cleaver market with about a 70% share. This cleaver is made from virgin carbon steel which is reactive and will patina and or rust if care is not used to keep it dry. The steel can take a very steep edge and is very hard with HRC62-63. 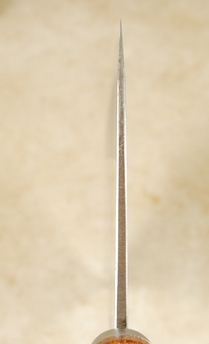 The handle has a traditional round shape and is comfortable to hold. We highly recommend this cleaver. 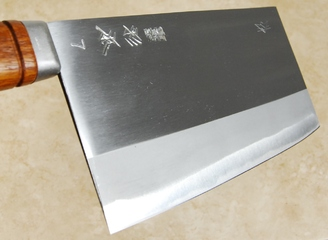 This Sugimoto Number 7 should be your second knife. Purchase it right after you get a 150 mm parring knife. This is the best of the best. This is a great Cleaver and excellent all purpose tool. I have used this knife for three years and I have several expensive cleavers in my tool set this is my favorite and the best. I highly and unconditionally recommend it! What can I say?This is probably the best knife I posess so far. It is heavy but cuts everything like it was hot butter. Moreover, it is easy to be sharpened.Yes, this huge cleaver is expensive but it is worth every penny. Fantastic cleaver cuts everything like hot butter. Worth the price, actually a bargain. A truly extraordinary cleaver. Astonishingly sharp out of the box and a joy to use. This cleaver is an absolute joy to use. Has a lot of weight to it, but is well balanced and keeps me fatigue free for long days of prepping vegetables. It sharpens easily and holds a great edge for a long time. I would highly recommend this to anyone looking for a high end cleaver. This is not a laser. However thin slicing and fine mincing are not an issue.